The Last Dragonslayer by Jasper Forde. Review: The Last Dragonslayer is an amazing novel about magic. Written by Jasper Fforde, it is a stand alone book. The main character, Jennifer Strange, manages Kazam which is an employment agency for magicians. Add a few dragons, and that's where everything gets difficult. Magic used to be popular but now it is fading. As Jenifer Strange is running Kazam, sorcerers begin to get visions of the last dragon dying. There is always a dragonslayer who has to kill the dragon. But news of the dragon dying begins to spread and everyone is awaiting its death. Once the dragon dies, the force field separating the dragons from humans comes down and enables people to cross the line. This brings much confusion and everything is very hectic because people want to claim their land that was once part of the dragonlands. While only the dragonslayer themselves and their apprentice may cross the barrier, when it is broken, anyone can roam freely about. Something might change and bring a new kind of magic called Big Magic. This can be greatly beneficial to Kazam, and Jennifer does not want to miss her chance. She sets out to find The Last Dragonslayer, but things go differently than she expects and she finds herself in the middle of it all. I give The Last Dragonslayer a five out of five rating. It kept me on the edge of my seat every second and I could not stop wondering what was going to happen next. I would describe this book as being similar to Harry Potter but much more realistic. I did have trouble understanding the book in the beginning with all the new people and characters. Although, once I sorted everything out, I understood perfectly fine. I would recommend The Last Dragonslayer to people 13 and older because it is a slightly difficult read. However, younger children can read it if they are up for a challenge. All in all, The Last Dragonslayer is a spectacular book, and I am sure that it will win many awards for the story that it tells. Review written by William (7th grade student). 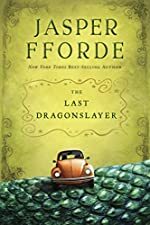 We would like to thank Houghton Mifflin Harcourt Children's Book Group for providing a copy of The Last Dragonslayer for this review. Have you read The Last Dragonslayer? How would you rate it?